Additive manufacturing has been anticipated as a primary part of in-space manufacturing for decades, although only in science fiction. Made In Space, Inc. is at the forefront of developing In-Situ Manufacturing (ISM) methods for orbital application, and 3D printing is a primary part of their product developments. Orbital vehicles have a unique set of engineering challenges that drive up their costs, and additive manufacturing has the potential to significantly reduce those costs. There are two key areas that ISM shows value. Component Design: Spacecraft need to be designed around intense the structural loads from launch acceleration and high vibration environments. 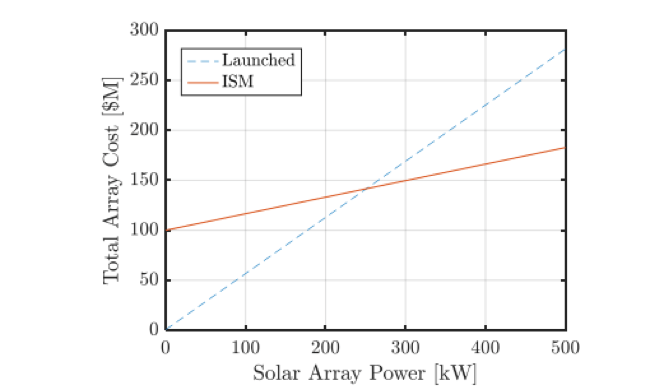 In addition, the volumetric constraints of the launch vehicle require solar panels and antennas to be folded or otherwise stored during launch. In-space manufacturing can solve these problems by building large volume parts on-orbit, potentially reducing mass by up to 30%. Even the cheapest commercial launcher to geostationary orbit (SpaceX) still charges a minimum of $7500/kg for launch to orbit. A 30% reduction in launch weight leads to savings of $18M for a program. The Archninaut project is intended to combine additive manufacturing techniques with robotic assembling systems to construct large orbital structures remotely. 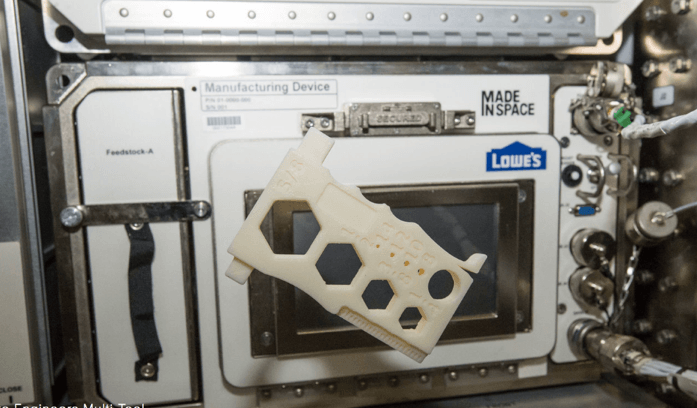 Although Made In Space is building significant progress in leveraging additive manufacturing in a new arena, there are still significant challenges ahead. First, orbit is not a single location- it’s an array of different orbital velocities that are costly to move between. Archinaut needs an ‘anchor’ customer, or to be solely used in a highly utilized plane such as geosynchronous orbit. The second issue with the Archinaut introduction is the long development cycle in space manufacturing. Partnering with NASA or other government customers also carries difficulties, including very limited service opportunities or, for international customers, ITAR restrictions. Although ultimately programs like the Archinaut show incredible potential, revenues from those sorts of projects are highly risky and far out. Significant investment should be made into attaining NASA research grants and becoming a highly reliable and valuable partner. Dependence on NASA seems unavoidable for the near term. In the long term, I believe that creating antennae or solar arrays for communication or earth observation satellites is unsustainable. The challenges in servicing the broad requirements of different vehicles, combined with the energy requirements to move between service locations pose incredible challenges. Instead, Made In Space should shift focus to growing and supporting new industries in space. Primary among the emerging new industries is space tourism, with organizations like Bigelow Aerospace and Axion developing commercial space stations. Moving forward, I think Made In Space needs to answer a few key questions about the path they’ve set themselves on. First, I’d like to see how past companies have transitioned from government grant funded models to commercial models in emerging technology markets. Second, I believe they need to develop strong partners in the commercial satellite manufacturing arena as soon as possible, and they need to find out the best way to partner and prove their capabilities to these new partners. I’d like to know the roadmap for creating strong partnerships with existing players, and what partners they expect to target. This is interesting. I wonder if the cost to have people in space could be a limiting factor to the ability to make items there. Will people with specific expertise be required and will it be worth keeping them on station? I am intrigued by the concept and understand the inherent merits of this type of construction. I am very curious to understand the materials and construction supply side of these processes. I imagine that there is a large constraint on capabilities to produce when you are essentially converting materials into a different, more usable form. It also seems that there might be less cost savings in the launching sense, unless you utilize materials in already in space for production. This is very interesting. I see the purpose of it, but am left wondering how useful could the printouts be. I tend to think that orbiting machinery has to have great quality assurance (QA). I doubt that with the current technology Made in Space will be able to deliver an array of products that surpass QA and deliver enough profit to sustain the business. Thank you for this insightful piece. Like many commenters, I question the quality standards and market potential of this technology. Common sense and this blog from NASA strongly suggest that high quality and reliability are paramount for rockets (https://www.nasa.gov/vision/space/gettingtospace/16sep_rightstuff.html). This is only increasingly important where the technology is used in manned rockets, especially commercial ones of the future where one tragedy could derail the entire industry. That said, I think there is opportunity to continue their current strategy of using the tech for non-critical things until the technology develops further. Additionally, the market potential for this company seems to be very small, so small that it may be hard for them to have enough volume to be profitable. There were 89 space flights in the past year, many of which were unmanned (https://en.wikipedia.org/wiki/2018_in_spaceflight). This is not a broad market. It is also unlikely that commercial space flight will widen the market in the near term. 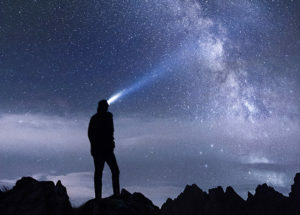 Despite the hype, most companies are mainly focused on deploying supplies to the international space station and launching astronauts (https://money.cnn.com/2018/01/04/technology/future/space-lookahead-2018/index.html). Accessible space travel for consumers seems far out which hurts the potential demand/profitability for this company. All in all, this is intriguing company but it has many hurdles on its path for success. Thank you again for this insightful article. While I am concerned space offers a very limited market as pointed out by nicivey, I think the applications of this technology are applicable beyond space ships and could be helpful in other hard to reach areas like submarines. The key will be to maintain patents so others cannot easily replicate the solution offering. 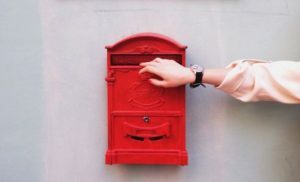 This was fascinating to read – thank you for writing on such a fascinating topic. I was not even aware that additive manufacturing was being applied to in situ manufacturing in space. The challenges you list associated with this application of additive manufacturing are immense. It does make me wonder whether this sector will ever be truly commercialised, or will remain the preserve of funding grants. It seems to me that until the technology is more advanced, commercial players will be reluctant to enter the space. This was fascinating — thanks for the submission. While the Archinaut project strikes me as somewhat “pie in the sky”, the company’s AMF product makes endless economic sense. I’m not sure what one of these spacebound printers cost, but I can’t imagine it would take many months for this product to pay for itself many times over given the elimination of stocking various replacement parts / items. My question here is whether Made in Space has truly distinctive technology — is there special patented tech required to make a standard commercial quality 3d printer function in orbit? In my mind, this is key. This is an excellent application of additive manufacturing, perfectly positioned in an environment where physical space is limited and the cost to carry supplies is massive. I envision a future world where our recycled materials and waste can be melted down to create the materials used in 3D printing. This would allow for essentially any product to be printed assuming we had the materials through the recycling program (e.g., plastics, metals). While it common to see such uses of 3D printing in many science fiction adaptations, the reality is not far behind! 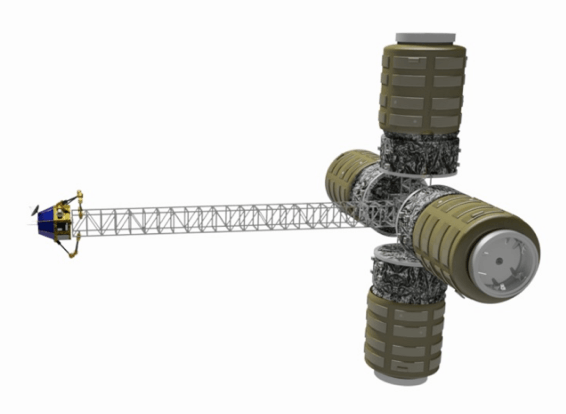 I can envision a future state where a space station prints and assembles itself and eventually people can live inside using smaller scale 3D printing to generate necessary tools and supplies during their stay. A potentially revolutionary idea if, as others have mentioned, Made in Space Inc. can work to ensure high quality, and eventually attain a point where the need for human interaction is greatly reduced. Taking this to my ideal extreme scenario: imagine that space vessels no longer had to carry all the extra weight in spare parts on their ascent, and could source all their raw materials in space. The cost of space travel would potentially drastically reduce and more people/organizations would have access. Sounds like the next logical frontier is space mineral exploration! For me the most striking part was about operations planning. It is clear why you cannot do just in time, but what can be they best way of scheduling the raw material deliveries to optimize inventory / blacklog? This is a much more difficult setup than any other transportation question we studied. Very interesting! This seems like a fantastic idea in theory, but I still wonder about the actual execution of astronauts or other space-operating individuals working the machines. Is it possible for the machines to be operated remotely from trained professionals in Houston or other NASA stations? If not, I wonder what is the training time required to learn how to operate these machines, especially in the challenging conditions that working in space presents. The transition to government to commercial-funded model also works nicely in theory, but it can only happen as quickly as overall space spending moves out of government – which I know is happening, but at what pace? This is a fascinating article. This is an industry that constantly has to innovate and this application of additive manufacturing makes a lot of sense. I wonder however, how is the operation of these printers in space and how the material/construction of space ships from 3D printing matches the safety standards of the company. While I’m not convinced that the practical applications of this company are astronomical (insert groan for dad joke here) due to issues with quality standards and and technical complexities of manufacturing in space, I am also concerned with the funding challenges briefly mentioned in the article. Since the vast majority of space exploration is publicly funded, I imagine that most potential customers are highly risk averse and would not be willing to try this technology until the cost savings have been proven, as a significant loss in public funds could bring additional scrutiny on agencies like NASA. 1. A large scale 3D printer on moon could potentially construct structures that would not be feasible given the difficulty getting large premade structures out that deep in space. Additive manufacturing is already being used in the construction of homes on Earth, and this technology, coupled with the proper communication technology, could allow humans to build on the moon prior to even having a person physically present (assuming the 3D printer can be preprogrammed or operated remotely). 2. I’m curious if the technology used for the Archinaut could also be applied to deep space probes. I’m not sure if this is currently a limiting factor, but presumably a robot could be installed on the deep space probe to detect and make small repairs whenever required during the probes journey. This would allow our probes to go further with fewer concerns of mechanical failure. This is a really cool and genius use of additive manufacturing. My question for the company becomes what barriers to entry do they have? Why can’t a space company start doing this as well? Are there patents around the technology? Is this really hard to do from a logistical perspective and not worth competitors times? I look forward to the day when full space ships are created using AM in space! Great insights and an appication that I didnt think about before at all. I think this platform could give them a great branding and marketing opportunity as well. Which then again poses the question how much and in which areas 3D printing has a sustainable future here on earth. Thanks for sharing! This is really interesting and something I did not previously know much about. Your question as to how Made In Space might transition to a more commercially viable company is especially interesting. I’d like to know more about the current limitations on producing in space and what innovations might be possible in the future. What changes would be necessary to the current product and process to make this more attractive to a commercial partner looking to produce satellites? What impact would different regulatory restrictions (if any) have on the process and current product if this does go down a more commercial path? Really interesting topic to contemplate? Very interesting article and I enjoyed learning about the applications within the space context. While I believe in the costs benefits of this kind of technology particularly when I applied to areas of manufacturing that can be tremendously costly, I am worried about the quality of production today. I’m thinking about space exploration, one must remember that in most countries, it is generally funded through public funds. The risk of failure or error is high and until quality can be assured, there will understandably be resistance to this innovation. I’m curious whether 3d printing tech will prove up to the task of making complex objects like satellites, especially given the highly technical nature of their components and the exotic materials often involved in their production. Plus, since launch cost is by far the largest cost of a satellite, won’t the materials cost just as much as the finished product to get into orbit? Lots of challenges remain for this idea, I think. Thank you for introducing such an interesting topic. I strongly agree with both your strategic recommendations for Made in Space, particularly with the first one (prioritizing smaller scale projects to reach quick-wins and financial returns). These recommendations are fundamental to enable Made in Space to break into the private sector’s zone of interest, as I truly believe that some sort of POC would be required to attract PPP opportunities or, rather, full private funding of the project in the foreseeable future.